Oh I really wish Little Bird Told Me had been around when No 1 Son was small, because they stock the most adorable baby toys, rockers, playmats and mobiles. I particularly love the ‘Hey Bear… it’s me, Bear’ range. 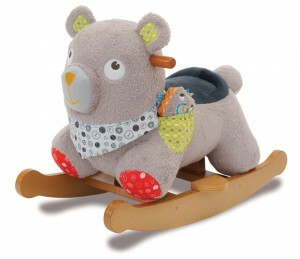 The rockers are SO cute – like this Baby Bear infant rocker (£88). Built around a sturdy wooden frame with detachable footplates, he has a plus huggable body covered in wonderfully textured bouclé fabric with lots of crinkles, and in his pocket he carries his friend Birdy Bear, who has a rattle in his tummy and crinkly wings. He’s suitable for 9months plus. 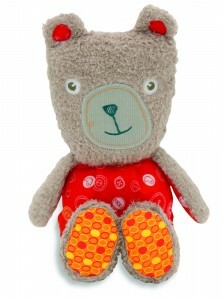 Then there are the wonderful baby soft toys – I love the expression on this Mama Bear Hug toy’s face (£14, suitable from birth). The good news is, in the last of my special giveaways to celebrate the second anniversary of The Mum Blog, I’m giving you the chance to win both of these in my fab competition. All you have to do to enter is leave a comment below telling me who you would give these fab prizes to (the winner will be chosen at random). 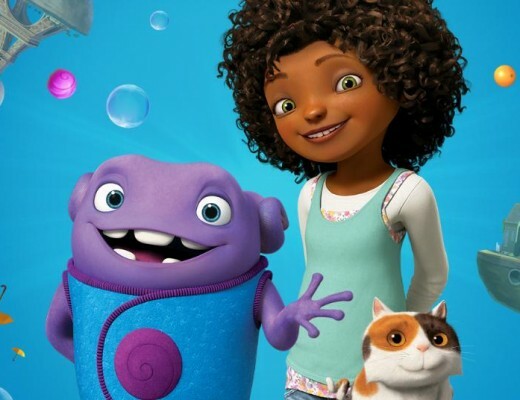 Entries close at midday next Friday (26 April), and the usual The Mum Blog competition rules apply. Thank you to everyone who entered, the winner chosen at random is Mel Briscoe. Congratulations Mel! Please contact me via the contact form to give me your details so I can arrange for your prize to be sent to you. Thank you everyone for entering – this competition closed at midday. The winner will be announced shortly. My gorgeous little girl Erin is just at the ‘sitting solo and climbing up on the sofa” stage so she’d love this soft rocker. The teddy is lovely too. To my lovely new niece or nephew who will be arriving very shortly!! My twin girls, due early July! These look like wonderful toys for their nursery as they grow up! I would give them to my sisters baby- due next week ! I would be giving them to our first baby, a little girl, who is due in September! The rockjer would look lovely as a decoration in the room until she is old enough to hop on and rock away!!! They would go to my sister’s little one, who is just a few weeks old. My baby, due in July! Oh my goodness, these are beautiful! I’d give them to my baby girl who usually just has her brother’s hand me down toys to play with. I have just been asked to be Godmother to my best friend from University`s daughter. I feel incredibly honoured and I will be looking after her through her life, as if she was my own. I’d give the prize to our niece who’ll be 1 next month! My nephew, who is due in June. My brothers first child. I’d give them to a friend who is having her first baby soon! My nephew (due June) – a nice present to save for him! I would give them to my sister as gift for my unborn niece/nephew!!! If I was lucky enough to win this great prize, I would give them to my cousins son,Noah. I’d give them to my future child. My little baby Nephew he is 5 months old now and would love these! I would give them to my three week old granddaughters. I’m sure their big sis will help them when they are old enough. I would give them to my gorgeous new baby. I know it won’t be long until he’s climbing onto the rocker. My 10 week old baby, she was born on my birthday – what a great present! I’d keep it for my baby boy when he’s big enough to rock the rockers out! I would give it to my sisters little one. My first niece/nephew. I’d give it to the wife. my first grandchild 🙂 im very excited! My baby girl-she’d love them. I would give them to my pregnant cousin for her baby when it is born. My nephew and his partner are expecting their first baby on 22 May. First baby in the faminy for a long time. Everyone is so excited. I would give it to Wriggler, my baby who is due in October! Too many people to choose from! I’d either give to my cousin for their forthcoming arrival or my best friends little girl. my lovely niece or nephew due in September! My little boy. He’s just started to love rocking toys! My friend who has just announced her first baby is due in October – she has been trying for a baby for the past four years, so I am so happy for her! I have a new nephew and a two-year-old niece (as well as olders ones) so it would be one each. Perfect! I would love these for my twin grandchildren, they could have one each & then swap round. To my physiotherapist who has just become a first time Dad! These are SO cute! I would give the rocker to my younger daughter, and keep the cuddly for baby number three due in December. I would give them to my little boy, then I am sure they would be passed on to our next little one. I would give them to my grand daughter if I could bear to part with them! my cousin has just had a baby so im sure she would love these. 2x grandkids would love this! I have a lovely friend with a new baby who’d just love these. totally love these! I would have them ready for our our 1st Grandchild which is due in September. I would give it to my niece that is due in a few months! My nephew and his girlfriend are expecting their first child in a few months. This would make a lovely gift to them. I have two baby grandsons one is 5months the other 2 months..would be lovely for their visits here..
My twin nieces but they’d have to share! My best friends are expecting twins and moving house too so busy and expensive times for them! I’d love to get together some goodies to give to them to help them get set up. My son/daughter due on 3rd June. I would have to give them to my daughter, the teddy is adorable! for my precious little one who is mad about cuddlies! I’d give them to my daughter who absolutely loves anything cuddly! My nephew (and hopefully his soon to exist brother/sister). I would give them to my boss, who is a lovely lady and will be going on maternity leave soon. These are lovely! I’d be tempted to keep them for my two but I have two nieces or nephews due later this year so I think I’d give them away to my new nieces/nephews! These would make a wonderful present for my baby daughter who is due to make her grand appearance in this world at some point over the next 5 weeks, and her big brother will love playing with the rocker until she’s old enough. I’m expecting my second baby, due in June, and it would great to have something new for it rather than hand-me-downs!! I would keep them for my little Jelly Bean he is only 11 weeks but they grow so fast!! I’d give them to my nephew.